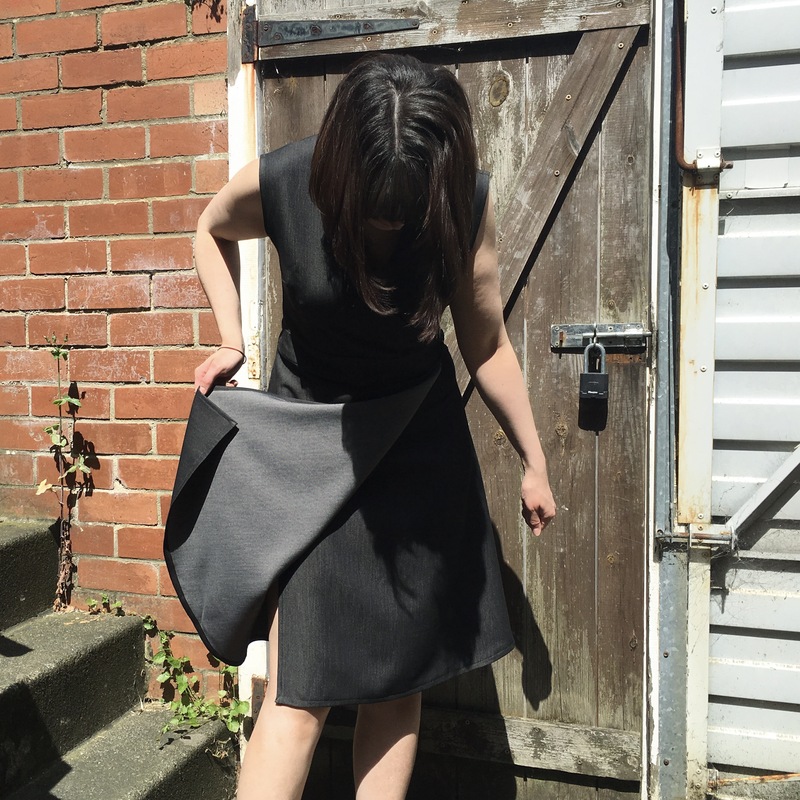 I write this on a day which is dull and rather chilly, which feels a million miles away from the day which I took the photos of this dress what I made. It’s been really hot here over the last few weeks which is really unusual for the extreme north of England. 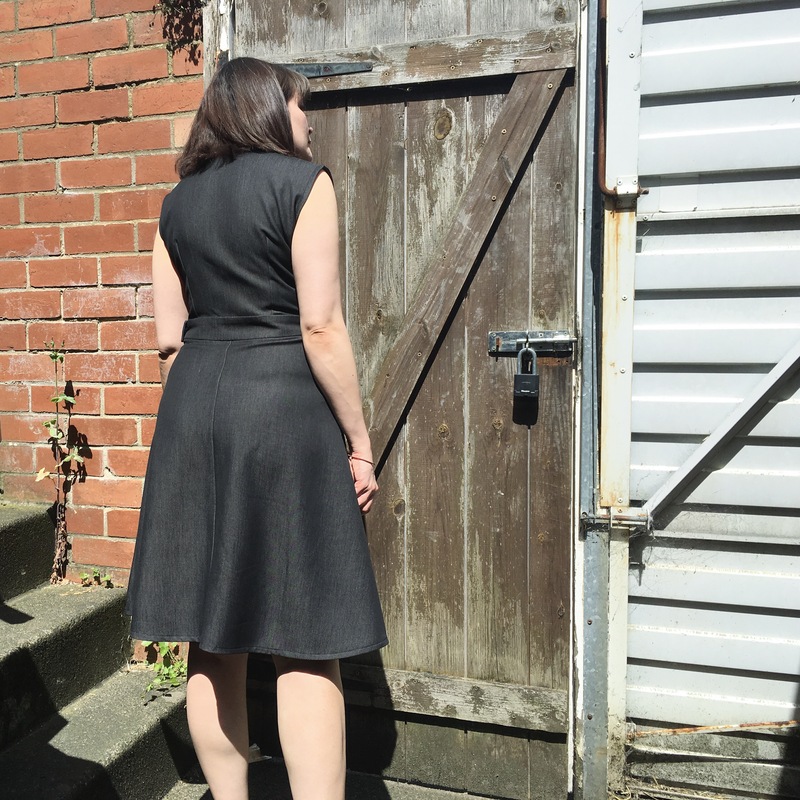 So to celebrate this bloody marvellous weather I decided to churn out my first summer dress. See… sunny! 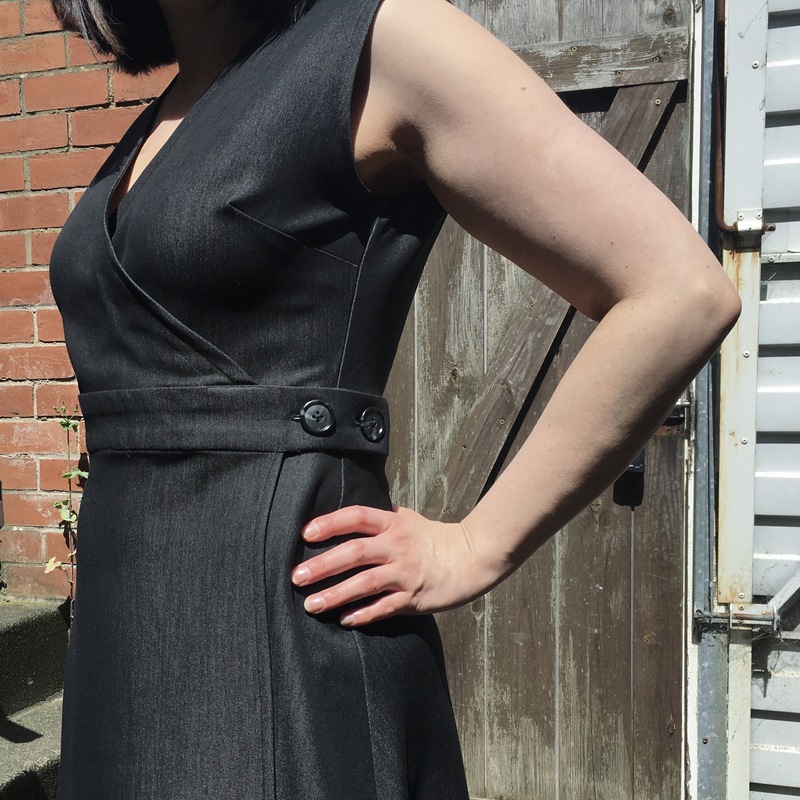 I decided a few months ago that I really wanted a wrap dress, they really are a flattering shape and I’ve never made one before… so there’s that too. 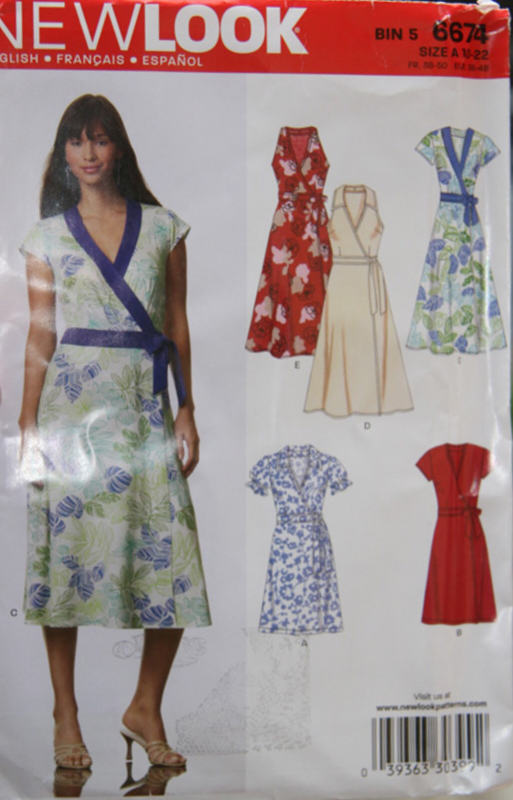 I did find a bit of difficulty finding a good pattern though as I wanted a woven fabric wrap dress… which there doesn’t tend to be too many of! So after some scouring I managed to find New Look 6674 which I think is an out of print pattern (sourced mine on eBay). 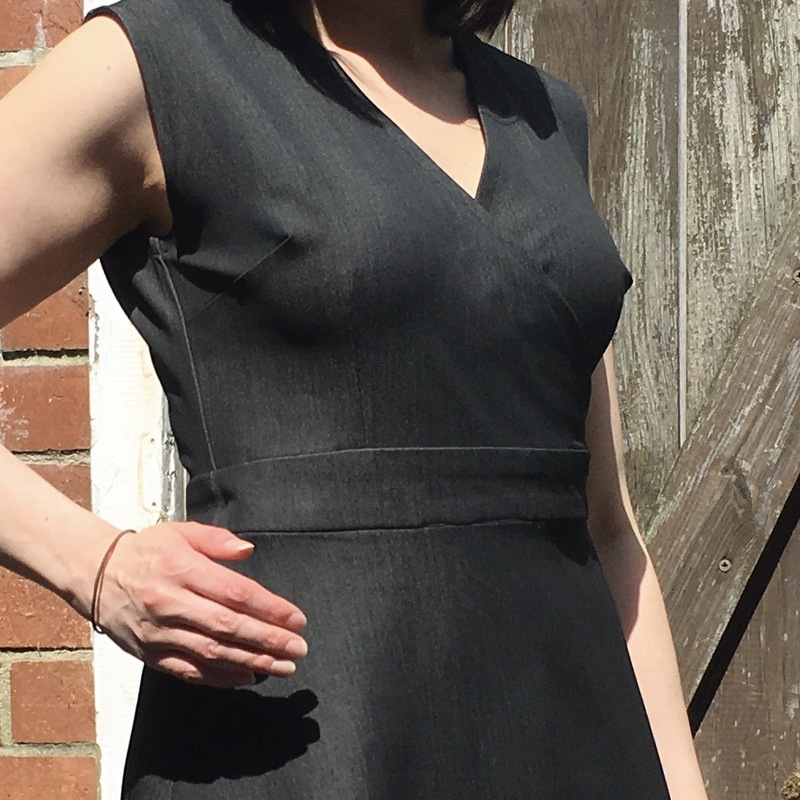 I wanted mine sleeveless, but in this pattern I’m not keen on the kind of racer shoulders in the sleeveless version, so I just made version B without the sleeves. 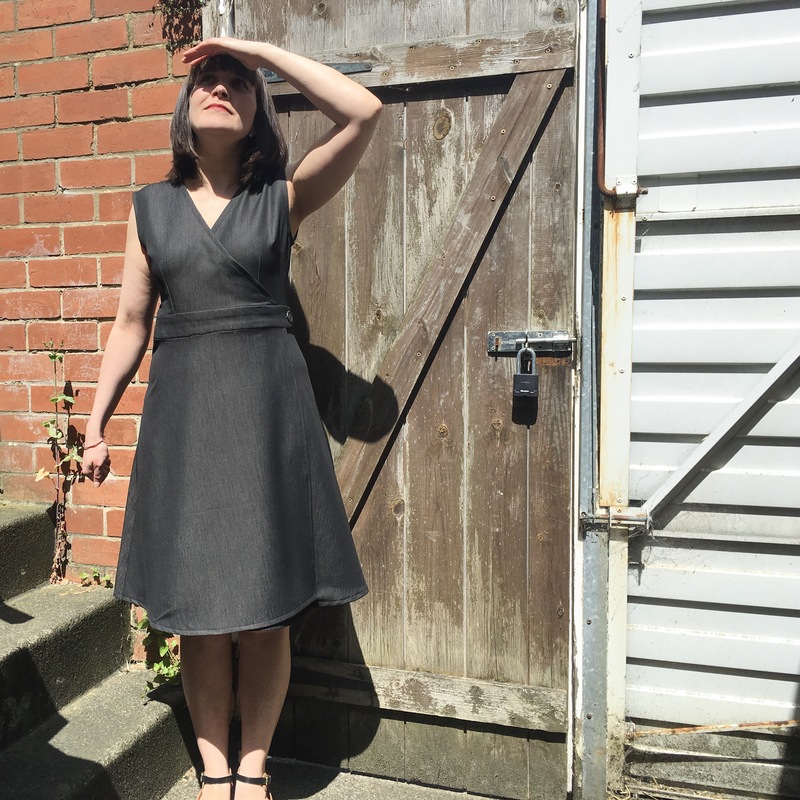 A word on the fabric, I used quite a heavy but very floaty stretch chambray from eBay… I love it so much I’ve bought more of it, I’m thinking of cropped trousers… and maybe another dress. It’s lovely stuff. Looking through the crack in the garage door there, snooping on the neighbours, snigger snigger. As far as putting the thing together… it went fairly easily. I can’t work out why the back skirt comes in two pieces, this just seems to be another unnecessary seam to sew and iron and finish. Ugh who’s got the time?! So if I make this again I’ll probably just take out the seam allowance and cut that piece on the fold. Yeah don’t ask what I was doing with my hand… pretending to be a Barbie I think. So yeah, the waist darts are fine, but I think the bust darts are a mite high, and stick out a bit. Another hack I did was to take off the tie, I thought it would be a bit bulky in the chambray, so I popped on two buttons (vintage buttons no less). It makes it look a bit school uniform, but I love it! As you can also see from the above picture, I also do need a modesty press stud. I did wear it for a whole evening though and only worried about bra flashing once, but once, methinks, is enough! 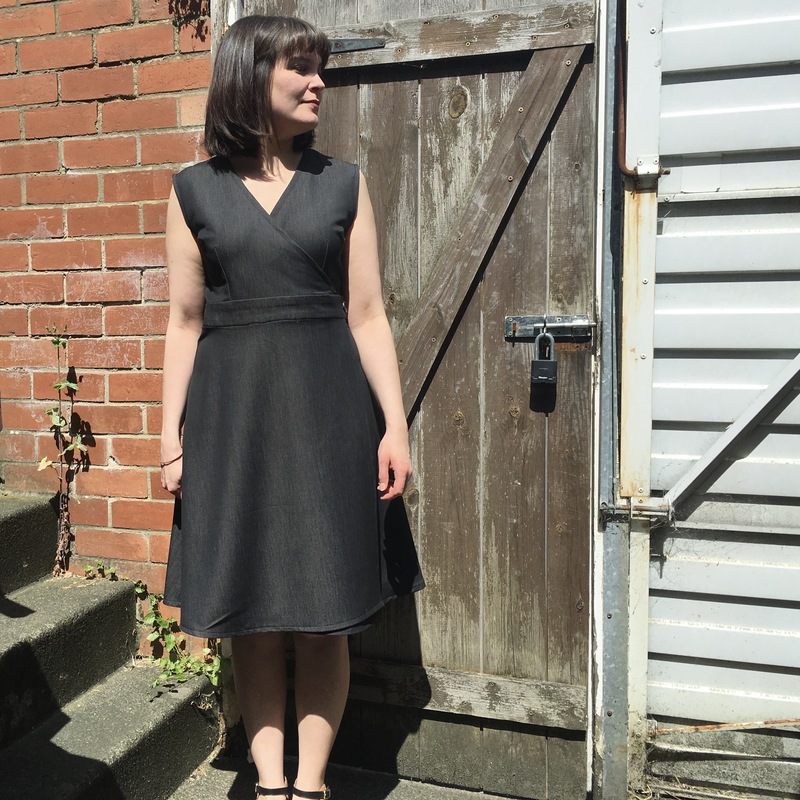 I wasn’t sure about the neckline facing either, I didn’t want the big thick band, so really unless you want to handstitch until your fingers drop off, I would recommend some bias binding. I finished the armholes with bias bind too and they came out just perfect!! Not as much as other skirts but it’s got movement there! 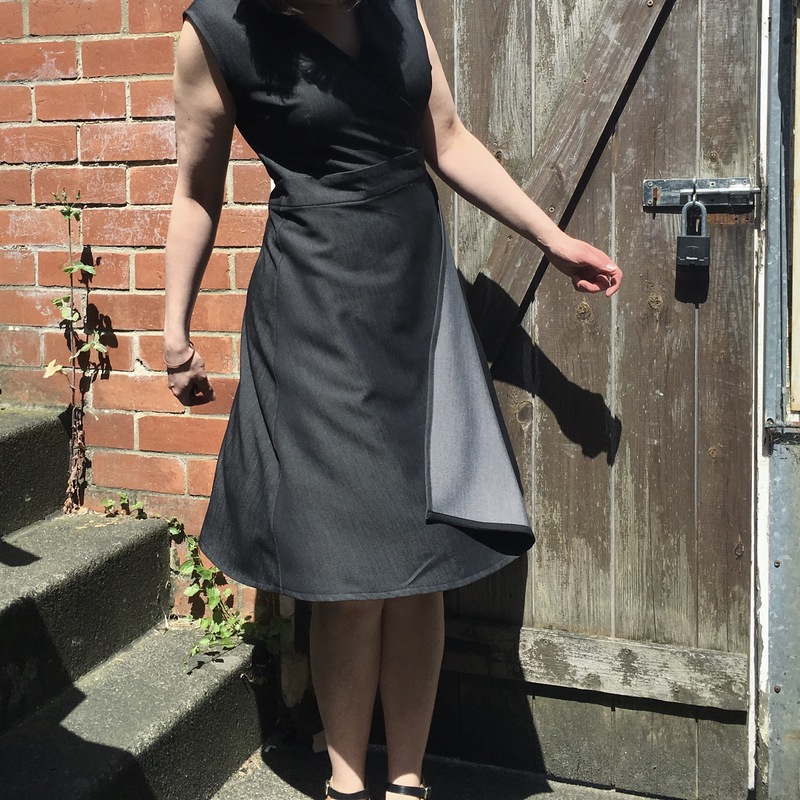 So my first summer dress finished, and I’ve achieved the holy trinity of… fits into wardrobe, comfy to wear, and can transition from day to night with a pair of heels and some jewellery!! So then, for now that’s all the sewing I’ll be able to do. We are currently in the middle of moving house and I’ve been forced to pack up my stash and machine (enter sobbing noise here). But this move means I get my own sewing room!! (Enter excitable squeak here). So you may see some knitting projects… I’m like almost completely nearly finished a cardigan! But other than that I’m taking a small hiatus. Now excuse me while I go to find out where our sunshine went… it’s round here somewhere!